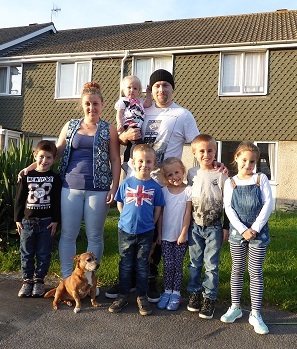 Families from opposite ends of the wealth and class divide swap homes, budgets and social status for seven days to discover how the other half lives in this thought-provoking, entertaining and uplifting new series which starts on ITV Choice on February 21, 2019, at 21h00. With the gap between rich and poor greater than ever before, the show follows two families from opposite ends of the wealth divide as they trade places to find out if money really does buy happiness. In each episode one family from the richest 10 percent and another from the poorest 10 percent, swap homes, budgets and lives for a week, following each other's spending patterns and weekly schedules. The two families never meet but after a week in each other's homes, they discover they have common ground even though they're financially worlds apart. But at the end of the week, how will they have reassessed their own day-to-day lives? And how much will they think money matters? In the first episode, the Caddy family of Bristol trade places with the Williams family from Weston-super-Mare. The Caddys rank in the top 10 per cent of Britain's wealthy, and live in a seven-bedroom home, while for the eight-strong Williams family, who are among the nation's poorest 10 per cent, the swap means leaving their rented three-bedroom house and enjoying a weekly budget of £1,700 instead of their usual £110. Anyone hoping the richer clan will reveal a judgemental streak will be dismayed to see James so sensitive to the iniquities of poverty: he rages at an exorbitant pre-pay energy meter, and gets stuck into DIY he senses Antony hasn’t time for. Meanwhile, the poorer couple share a touching moment when Antony realises the cash in his pocket can make a dream come true. Rich House Poor House is about much more than money: it's about families, parenting, relationships and dreams. The stories of the two families chime with anyone watching, however much money they have.